TUG-OF-WAR between a paddle steamer and a screw-propelled steamer to decide the more effective method of propulsion. In 1845, H.M.S. Rattler, driven by a screw, and H.M.S. Alecto, fitted with paddles, were tried against one another in a spectacular tug-of-war. Although the vessels were of equal size and nominal horse-power, H.M.S. Rattler succeeded in towing her rival at a speed of nearly three knots. WE have traced in earlier chapters the story of the marine engine as applied to paddle steamers. The screw propeller, however, has been universally adopted for all ships except those used for pleasure excursions and for navigation on shallow rivers and lakes. It was not until the paddle steamer had reached a high standard of efficiency that the screw propeller was generally adopted by the marine engineer. But for many years propulsion by screws had been suggested from time to time by various inventors. As early as 1729 an inventor named Du Quet suggested a screw for propelling ships, and similar proposals were made by Daniel Bernoulli in 1752 and by Bramah in 1785. In 1794 a triple-threaded screw was patented by William Lyttleton. 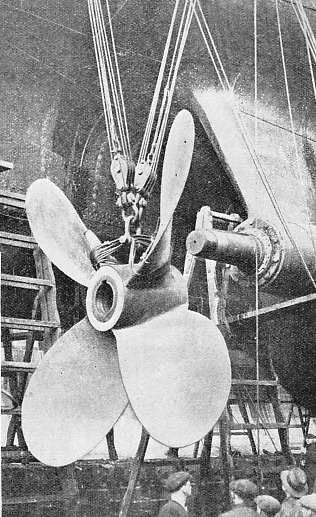 This propeller was designed for mounting in a frame attached to the ship’s hull. It was to have been driven by manually-operated winches through a system of ropes and pulleys. A boat fitted with this device was tried in Greenland Dock, London, but a speed of only two miles an hour was attained. A similar device was invented by Edward Shorter in 1800. This consisted of a two-bladed propeller on an inclined shaft supported by a buoy at the stern of the vessel. The inclined shaft carrying the propeller was driven through a universal joint by a second shaft on the ship above the water-line. The transport Doncaster was fitted with Shorter’s propeller. With eight men at the capstan to provide the motive power, she attained a speed of one and a half miles an hour during a calm in Gibraltar Bay and later at Malta. Edward Shorter also suggested that his propeller might be driven by a steam-engine, but the first attempt at this method of ship propulsion is credited to an American, Colonel John Stevens, in 1804. Colonel Stevens’ boat was a small twin-screw steam launch. She made a number of successful trial runs in New York Harbour, but these experiments were not crowned with any commercial success. It was not until 1837 that the screw propeller was successfully applied to ships, and the honour of contributing this important development in marine engineering is shared by Francis Pettit Smith and by Captain John Ericsson, who worked independently. In 1836 Francis Smith, a farmer at Hendon (Middlesex), patented a single-threaded screw propeller with two complete twists resembling part of a large cork-screw. This revolved in a recess at the stern of the ship. Smith conducted his early screw experiments with a clockwork-driven model on a pond. So successful was this little boat that a launch of 6 tons burden, named after the inventor, was built at Wapping. The screw, mounted on a horizontal shaft, was driven by bevel gearing through a vertical shaft reaching above the waterline. The motive power was a steam-engine with a cylinder of 6-in bore and 15-in stroke. This launch was tried on the Paddington Canal, where, in 1837, a fortunate accident led to further improvements in ship propulsion. During one of the launch’s trips on the canal, half of the wooden propeller was broken off, and to the surprise of the crew the speed of the craft was immediately increased. A metal screw, consisting of one complete turn instead of two, was then fitted to the F. P. Smith, and she subsequently made some voyages in the Thames estuary from London to Folkestone at a speed of about five and a half knots. After these experiments Smith amended his patent specification in 1839 and his screw was described as consisting of a single turn or alternatively a double thread with two half-turns. In this manner was evolved the two-bladed screw propeller. It was also at Hendon - where Francis Smith carried out his first experiments - that, nearly a hundred years later, other interesting propeller experiments were carried out, this time on the early aeroplane. A TRIPLE-THREADED SCREW, patented by William Lyttleton in 1794. It was mounted in a frame that could be attached to the bow, stern or sides of a ship. The screw was designed to be operated manually by ropes from winches on the vessel’s deck. A company was formed to exploit Smith’s amended patents of 1839, and in the same year the Archimedes (237 tons) was launched. She was equipped in the first instance with a single-thread screw 7 feet in diameter. This propeller was subsequently replaced by a screw of the two-bladed type, 5 ft 9-in in diameter, turning at 139 revolutions a minute. The engine made only 26 revolutions a minute and was connected to the propeller shaft by gearing. The Archimedes attained a speed of nine knots and, in addition to the circumnavigation of the British Isles, she made a voyage to Oporto, in Portugal. These successes proved the suitability of the screw propeller for marine purposes, and Francis Smith was knighted in 1871 for his services to shipping. The famous engineer, John Ericsson, of Sweden, after his retirement from the Swedish army, settled in England and worked independently of Smith. In 1836 he patented a screw propeller consisting of two drums on a shaft. Either drum had a series of helical blades round the periphery, and the blades on one drum were inclined in the direction opposite to those on the other drum. An interesting feature of Ericsson’s propeller was the arrangement of the two drums. These were mounted on a common axis, but they revolved in opposite directions. The after drum revolved at a faster speed because it acted in water that had already been set in motion by the forward drum. The reversed direction of the after drum was intended to counteract losses caused by the rotary motion of the water behind the leading drum. The arrangement of duplex screws was not adhered to in marine practice, because experience indicated that the complication involved did not improve performance. Ericsson himself often made use of a single screw. A survival of twin screws revolving in opposite directions on one shaft is found in the modern torpedo. The arrangement is there used to counteract the “torque” or force that would endeavour to turn the torpedo over against the direction of a single propeller’s rotation. PATENTED IN 1800, Edward Shorter’s screw propeller was described as a “ perpetual sculling machine”. The screw was submerged in the ship’s wake and was prevented from sinking by the buoy. Manually operated, the screw was given a trial in the transport Doncaster, in 1802. The best speed was under two miles an hour. Francis Smith, as we have noted, used models for his early experiments and Ericsson adopted similar measures. He experimented with a model ship in a circular tank, from the centre of which projected a tubular arm. The model was fitted with a propeller driven by a small steam engine. Steam was supplied to the engine through the rotating tubular arm. The first practical test of Ericsson’s propeller was carried out on the Thames in 1837. A 45 ft boat, the Francis B. Oyden, was fitted for screw propulsion. She towed the Admiralty barge, with some of the Lords of the Admiralty on board, from Somerset House to Blackwall and back at an average speed of ten knots. After other experiments had been carried out, a United States naval officer, Captain R. F. Stockton, arranged for the construction of a vessel 70 feet long by 10 feet beam, with engines driving direct on to the propeller shaft. This ship, the Robert F. Stockton, was built at Birkenhead by Laird Bros, in 1838, and attained a speed of thirteen knots with the tide. She crossed the Atlantic under canvas early in 1839 and saw many years service as a tug in New York harbour under the name New Jersey. Ericsson left for the United States later in 1839. There his invention was used in a number of American river steamers and in the U.S. warship Princeton, built in 1842. The superiority of the screw propeller over the paddle wheel for the propulsion of ocean-going ships was generally accepted by the end of 1845. In April of that year occurred the famous “duel” between H.M.S. Rattler and H.M.S. Alecto. The vessels were similar in size and of equal nominal horse-power, but the screw-driven Rattler, when lashed stern to stern with the paddle-sloop Alecto, was able to tow her rival astern at a speed of nearly three knots. This test, however, cannot be regarded as conclusive in favour of the screw. The Rattler’s engines developed 300 indicated horse-power against the Alecto’s 141, in spite of their equality in nominal horse-power. The engines of H.M.S. Rattler were of Maudslay’s “Siamese” type and drove the shaft through spur gearing which increased the propeller speed to 113 revolutions a minute, or four times the speed of the crank. The propeller is preserved in the Science Museum at South Kensington. With a diameter of 10 ft 1¼-in, it is made of cast gun-metal and weighs 1 ton 6½ cwt - an interesting comparison with the 35-tons phosphor-bronze propellers of the R.M.S. Queen Mary, built some ninety years later. 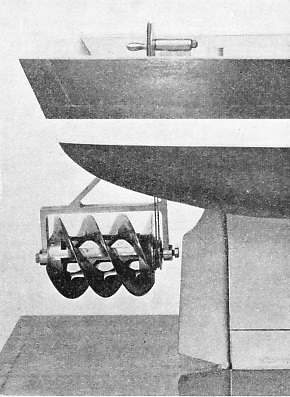 TWO PROPELLERS IN ONE, as now used in an improved form for the modern torpedo. This form of screw was the invention of Captain John Ericsson, the famous Swedish engineer, in 1836. 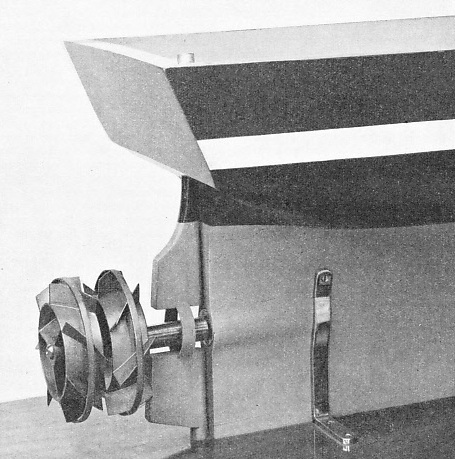 The forward drum, fitted with helical blades, revolved in one direction and the after drum was turned in the opposite direction at a faster speed. The development of the screw propeller was due to many factors apart from efficiency. A screw propeller cost less than a pair of paddle wheels. It was also more convenient to fit in a ship’s hull, as it required no sponsons or paddle boxes. For the propulsion of warships, the obvious advantages of the screw were fully appreciated, though the Admiralty at first thought this method of propulsion would interfere with steering. The outstanding advantage of the propeller over paddle wheels for naval use was, however, its comparative immunity from the effects of gunfire. Propellers were generally completely submerged and the motive power was housed below the water line. Another reason for the preference of the screw propeller was that it could be used more readily than paddle wheels as an auxiliary means of propulsion for sailing vessels, or for driving ships during calms. Paddle wheels in a sailing ship under canvas were scarcely an asset when stationary, for the paddles acted as highly efficient anchors and retarded progress enormously. Various expedients were tried to enable a paddle ship to discard her wheels in a fair wind. Floats were constructed to move inwards towards the paddle shaft. Sometimes the wheels were so made that they could be dismantled at sea and stowed on deck when not required. The drag of an idle screw-propeller was not as serious as that of two paddle wheels. One device used was the “banjo” frame which carried the screw and was free to move in vertical guides. The top of the frame was provided with sheaves through which passed chains or ropes to other sheaves attached to a girder above. This girder was secured to the ship’s deck, and beneath it was a hollow trunk through which the screw could be hoisted up clear of the water. The hoisting chain passed through the sheaves and led to a winch or capstan on deck. It was necessary to detach the propeller from its shaft before it could be hoisted, and the trunk was of such shape that only a two-bladed screw could be used. Other devices included the use of propellers with movable blades which could be adjusted from within the vessel. A two-bladed screw with the blades arranged vertically and pointing fore and aft was masked by the ship’s sternpost and offered little or no resistance in its passage through the water. Similar arrangements could also be made to vary the pitch of a screw propeller by altering the angles of the blades. This practice enabled the engines to be used to the best advantage in varying conditions of wind. In the famous steamer Great Eastern the screw, when not required for propelling the ship (she had also paddles and sails) was revolved by small auxiliary engines and so neither helped nor hindered her speed. After the valuable work of the early pioneers in propeller design, a type of screw was evolved that was in general use until about 1860. This was known as the common screw, and had wide tipped blades and a small cylindrical boss. The common screw, however, had two main disadvantages. The portions of the blades nearest the boss served no useful purpose and were in fact a source of weakness, for the boss was made as small as possible. The wide, fan-shaped tips of the blades absorbed a large amount of power without adding to the thrust of the screw, and they also contributed to vibration. In 1849 an engineer named Robert Griffiths began a series of investigations on the action of marine propellers, and this work was carried on until 1855. The outcome was the patenting of a propeller that overcame the disadvantages of the common screw and incorporated a number of other improvements. The central portion of Griffiths’ propeller was filled up for about one-third of -its diameter by a spherical or ellipsoidal boss. From this boss the blades widened to a maximum width about two-fifths along the radius from the centre and then tapered off again to a flattened end. The principles of the Griffiths screw are embodied in most modern propellers, although his blades were separately attached and adjustable for pitch. Modern propeller blades are now cast solid with the boss, which is proportionately smaller. In addition to Robert Griffiths there were other inventors, both before and after his time, who devoted their energies to the improvement of the screw propeller. The problems associated with screw propulsion are complex. Size, weight, revolutions a minute, the number of blades and their shape, all have to be considered in designing an efficient propeller. The correlation of all the qualities that combine to make the ideal propeller is a task involving great technical skill, but some of the difficulties met with in this branch of marine engineering may be stated without discussing the matter in all its purely scientific aspects. A ship’s screw acts on water that is not at rest. A ship as she moves forward carries some water with her, and the shape of the hull aft materially affects the screw’s performance because of its influence on the way the water approaches the screw. If we regard the approaching water in the form of a cylindrical column whose velocity is increased by the action of the screw, such a column should be decreasing in diameter to yield the maximum efficiency. It is obvious in these circumstances that there should be no outward movement of the column of water, as this would cause its diameter to increase. Many inventors have designed propellers that were intended to overcome this difficulty. In 1843 the Earl of Dundonald patented a propeller with the blades inclined aft to prevent any outward flow of water. Other inventors provided concentric ridges on the blades to achieve the same object, and some screws were sickle-shaped. A sickle-shaped propeller was patented by Hermann Hirsch in 1860-66, and in 1870 a number of ships were fitted with four-bladed screws of this type. Originally the vessels had been equipped with Griffiths screws, and it is said that after the change their speeds were increased by about one knot. Another problem that propeller designers tried to solve related to the backward motion imparted to the water by the leading or fore-part of a propeller blade. It is on this water already set in motion that the after part of the blade has to act. 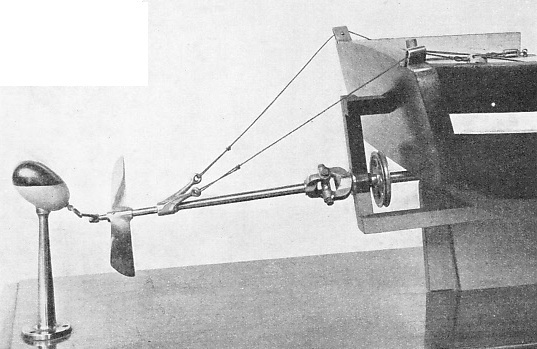 Ericsson, as described earlier in this chapter, endeavoured to overcome this difficulty by using a propeller in two parts, with the after portion revolving at a faster speed than its fore-part. 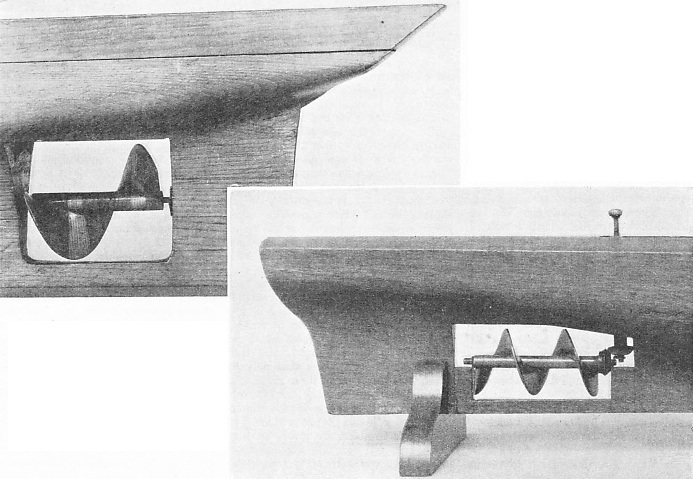 Before the patenting of Ericsson’s propeller, however, another inventor - Bennet Woodcroft - had patented, in 1832, a screw with the pitch gradually increasing in a sternward direction. The greater pitch facilitated the attainment of a higher speed. Vibration is an ever-present problem with the propeller engineer. Engines and propellers may all be in perfect “balance” and yet the blades may pass successively through areas of water with widely different velocities. Such circumstances produce the same effects on the blades as a series of blows, and thus set up vibration. The trouble is accentuated if the frequency of these blows happens to coincide with the vibration-frequency of the ship’s hull. One remedy is to alter the number of blades in the propeller. An instance is recorded of the S.S. Soemba, a single-screw ship of 6,718 tons gross, built in 1923. She was originally provided with a four-bladed propeller that was subject to excessive vibration. An improvement was effected by changing the propeller and substituting a screw with five blades. THE ORIGINAL FORM of the screw propeller patented by Sir Francis Smith is seen on the right. In 1836, the launch F. P. Smith, fitted with this screw, was given a trial on the Paddington Canal, London. Half of the screw broke off, and this gave the vessel a considerably faster speed. The inventor then devised the screw with a single turn, as shown above. This is, in effect, a two-bladed propeller. Since the time of Smith and Ericsson great improvements have been effected in the design and construction of marine screw-propellers, but of necessity there is considerable loss of energy in propulsion due to the motion given to the water and to the friction with the blade surfaces. Only about two-thirds of the power delivered by the shaft to the screw is usefully employed in driving the ship. The fact that the propeller shaft was even lower in the ship than the crankshaft of a paddle-steamer necessitated the introduction of new ideas in marine engineering. Many and ingenious were the devices subsequently employed to fit engines of the requisite power in the confined space of a ship’s hull. Designs for marine engines followed one another ceaselessly as improvements were dictated by experience and careful experiment. Finally the vertical reciprocating engine was evolved, with inverted cylinders mounted on framework fore and aft in line with the propeller shaft. The gradual process of determining the best position for the reciprocating steam engine in a ship led to the ideal arrangement for the multi-cylindered heavy oil engine - a modern rival of the steam reciprocating or turbine engine. The early screw engines, in common with their contemporary paddle-wheel engines, rank among the finest examples of British craftsmanship and engineering. It has been shown in an earlier chapter (see page 299) how the first paddle engines were evolved from the massive stationary engines used on land. Even the ornamental iron framework, despite its weight, was faithfully copied for marine use. MODERN PROPELLER DESIGN is based on the screw shown here. This screw was patented by Robert Griffiths in 1855. To the central boss, about one-third of the total diameter, are fitted helical blades that increase in width before tapering to a flattened point. The first screw engines similarly exhibited the main features of the engine then in use for driving paddle wheels. The marine propeller, however, requires a higher rate of revolution than the paddle wheel. Means had therefore to be adopted to “speed up” engines to meet the new conditions imposed by screw propulsion. To obtain a faster propeller-shaft speed without increasing the speed of the engines, gearing was employed in a number of different forms. Ropes or belts were sometimes used on pulleys of different sizes to obtain the necessary shaft speed. More frequently, however, chains and sprockets or toothed wheels were used. Many early marine engines were fitted with toothed or “spur” gearing. The modern engines of the R.M.S. Queen Mary also drive her propellers through gearing, but in this instance the huge gear wheels are designed not to increase but to reduce in transmission the tremendous speed of the great ship’s turbines. Propellers, it is stated, require greater speeds than paddle wheels. They must not be driven too fast, however, or the phenomenon of “cavitation” will occur and cause loss of efficiency. When cavitation takes place the speed of the screw forms a cavity in the water and causes the screw to spin round without pushing the ship forward. By the device of gearing, the power of the high-speed turbine is transmitted without loss of efficiency to the modern propeller, which revolves at a slower rate. An exception to the use of geared engines was the method employed in the steamer Robert F. Stockton of 1838. referred to above. This vessel was driven by direct-acting engines running at fifty revolutions a minute, a speed then considered to be dangerous. FIFTEEN FEET IN DIAMETER, the propeller shown right is being fitted to one of the tail-shafts of the Canadian Pacific liner Empress of Australia. This liner, of 21,833 tons gross, has two propellers of this four-bladed type. Note that the central aperture is not completely circular, but has a slotted top into which is fitted a key to transmit the drive of the shaft. A hub cap of conical shape prevents the propeller from falling off.